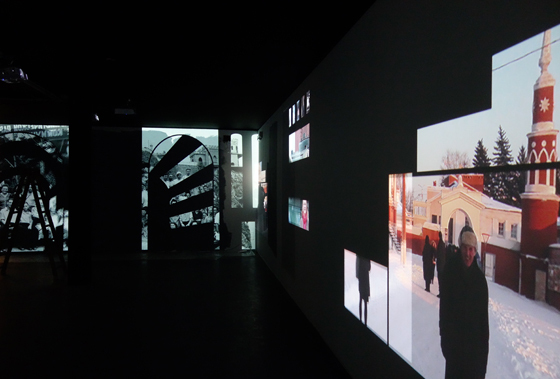 In March 2015 Factum Arte Bologna was contacted by the artist Irina Nakhova and Grappa to design and setup a complex video projection in the Russian Pavilion for the Venice Biennale 2015. 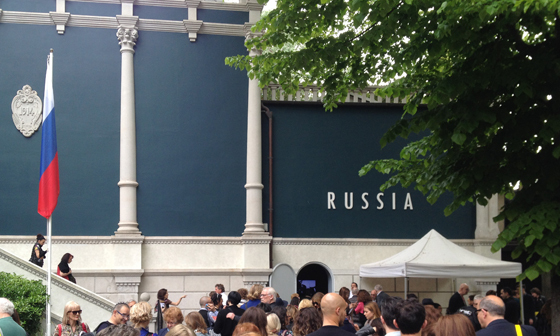 Irina Nakhova was invited to make an installation occupying the entire Russian Pavilion in the Giardini. 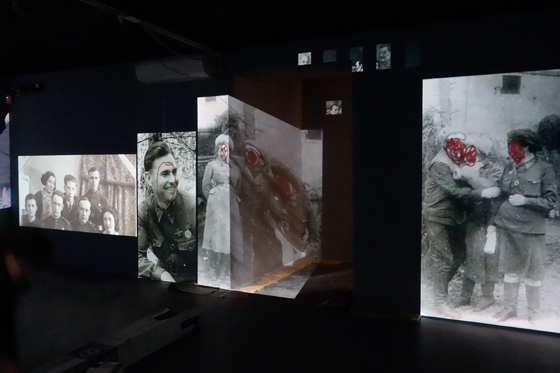 The lower room was devoted to a multiscreen dynamic video installation - the projection is of both personal and found archives transferred from Super 8 and VHS to a digital format. The material relates to life in the URSS and engages with memory, both individual and collective. 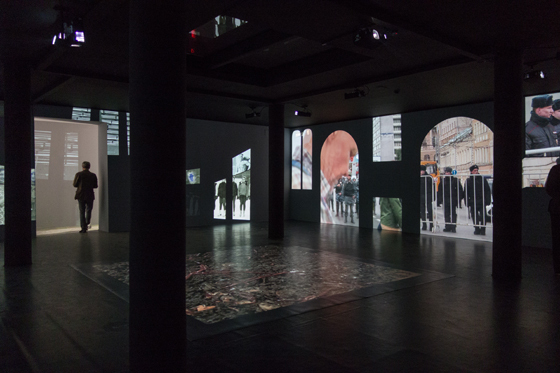 The video projection is structured in a lattice-work of animated windows covering the the four walls and the floor. The room measures 11x11x3m. 3 projectors with edge blending were needed for each wall and a 13th projector for the floor. 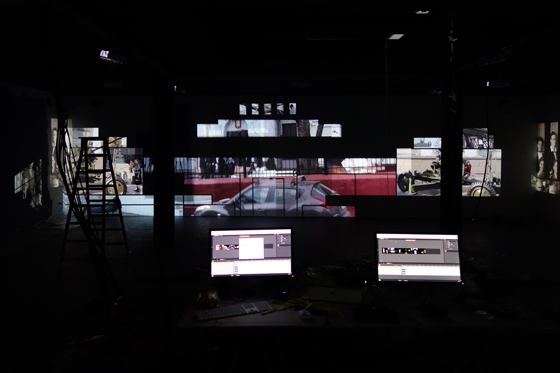 All projections are synchronised, a total of 17,280 x 1080 video files were mapped, warped and played from 2 Mac Pro running Millumin (a video-show and mapping software), through a set of EDID and diverse adapters as a Datapathx4. The two Mac Pros are controlled remotely through SSH and screen sharing to manage the projection from a remote location (Bologna). 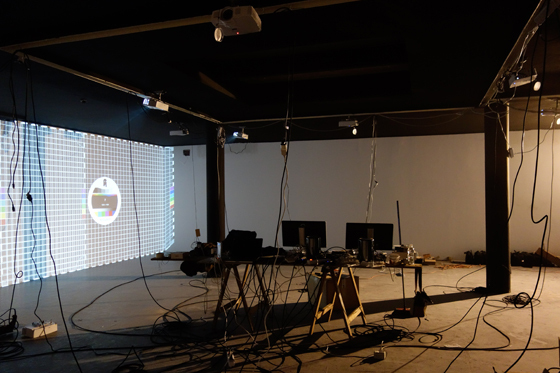 2 Webcams in the room enable the functioning of the installation to be controlled in real time from afar. The material of the video relates to life in the URSS and engages with memory, both individual and collective.